All pets, from dogs, cats and hamsters, to birds, fish and even reptiles are invited to join in the fun - the only rule is that they need to be a dead ringer for their owner, or vice versa. 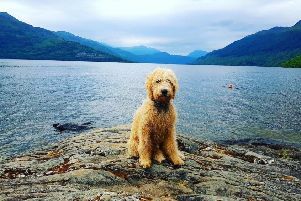 People of all ages from around the country can take part by sharing a photograph of themselves and their pet on social media, using the hashtag #DoggieDouble. The initiative, which aims to set a record for the UK’s largest pet look-a-like gallery, has been launched by My Nametags, a British name tag and label company, in support of the Battersea Dogs & Cats Home charity. Organisers are hoping to gather hundreds of photographs for the gallery, which will be hosted online at www.mynametags.com/Battersea-dogs. As an added incentive, My Nametags will be giving one entrant per day a free set of name labels, either for them or their pet. My Nametags has also partnered with dotcomgiftshop.com to give away a bundle of goodies worth £100 to one lucky entrant. The winner will be the duo with the most votes on the My Nametags’ ‘Doggie Double’ online gallery. The prize includes products from dotcomgiftshop’s pet accessories range, which includes fun and colourful bandanas, collars, leads, and even socks for their beloved pet. The competition will run from Thursday 12th October until Monday 13th November 2017. The winner will be announced on Wednesday 8th November 2017. Share a photograph on Twitter, Facebook or Instagram using the hashtag #DoggieDouble, or email the photograph to doggiedouble@energypr.co.uk. All images will then be uploaded to a gallery on the My Nametags website, where people can vote for their favourite duo. As an added way to support the charity, and to give pet lovers nationwide a chance to buy official Battersea Dogs & Cats Home name tags, either for their pets or themselves, My Nametags has created a range of iron on and sticker name labels dedicated to animals at the charity. A percentage of the sales from the Battersea Dogs & Cats Home labels will go towards supporting the charity. Fans of furry friends can now choose from cat designs, ‘Smudge’ and ‘Lola’, or dog designs ‘Alfie’ and ‘Ollie’.